Van Gogh’s Self-Portrait with Grey Felt Hat was painted in the winter of 1887/88 while he was still in Paris, however it marks a major stylistic departure from his oeuvre. Still under the thrall of Impression in terms of painting style, van Gogh, however turns to neo-Impressionism for picture composition and stylistic idiom. The circular arrangement of the background, principally in blue tones, appears dynamic and in motion, while van Gogh’s face is clearly demarcated from the blue background by hues of ochre and red, forming a second visual plane. This impression is further reinforced by the brush strokes of the fore and the background almost consistently meeting at hard angles. The clash of form and colour and the effect of motion inherent in the painting make it an ideal choice for transforming a self-portrait into an animated portrait. The paucity of expression on van Gogh’s face contrasted with direct eye contact with the observer also offer great potential for 3D transformation. The process involves creating a depth mask in Photoshop. This features darker sections to mark the areas of the image in the background and lighter sections for foreground elements. The foreground is then isolated from the background and the canvas ratio is set to 16:9. The background, on the other hand, is separated into its blue and ochre components and the brush strokes are simulated using a paint synthesiser (Studio Artist). Final compositing is done in After Effects. 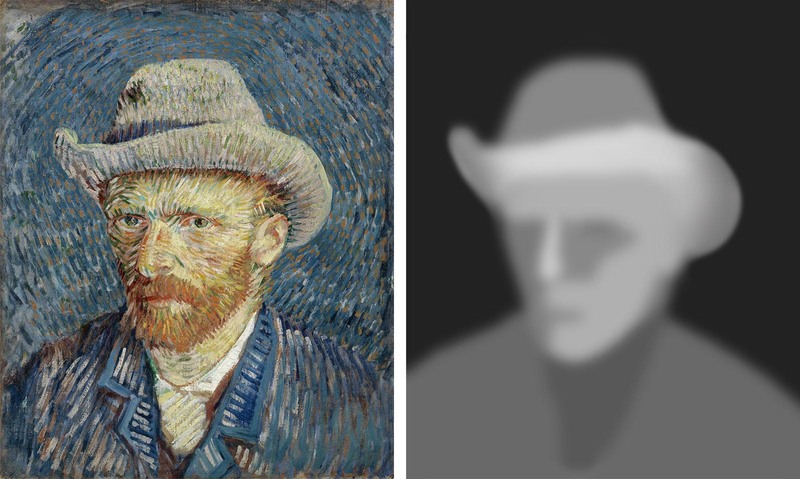 FreeForm plug-in and the depth mask are then used to extrude van Gogh’s face as a relief. Finally, the background layers are animated in a circular motion, and the composition is rendered using a virtual camera movement. Neckenig, Franz: Vincent van Gogh: Von der historischen und überhistorischen Schönheit der Kunst. Berlin 2015.